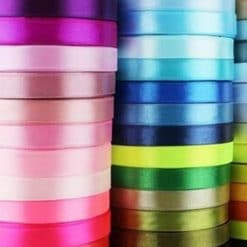 15mm wide printed ribbon, printed ribbon in the UK by Personalised Printed Ribbons are beautiful satin ribbons that can be printed with your own design of text and/or logos. The 15mm wide ribbon is ideal for gift wrapping, decorating cards and also small hampers. We offer standard printing for decorative applications, a shiny print for festive wrapping and a specialist waterproof option suitable for gentle machine washing.